The infant year is a time of tremendous growth and learning, both for infants and their families. During this time, infants develop attachments to their families and caregivers that are critical for infant development. These attachments are formed when we attend to their basic needs (feeding, changing, sleeping), provide love, attention, communication, physical contact (holding, hugging, walking) and stimulation of all their senses. Good care giving and strong attachments help babies to form neural connections in their brains that will set the stage for learning later in life. We know that babies grow and learn best when they feel secure. 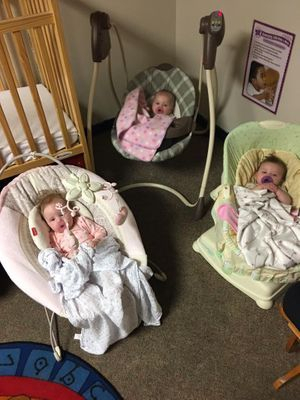 At First Baptist Daycare your infant will be cared for by Ms. Misty, our lead teacher and Ms. Lonnie, our afternoon teacher. These ladies will do more than simply meet your child’s basic needs. They will develop a relationship with you and your child, and will nurture your child through this exciting period of development. They will listen to infants by interpreting their cries, demeanor, physical clues and moods. They will interact with your child on a continual basis, ensuring the appropriate amount of sensory stimulation to foster infants’ physical, sensory, social, emotional and intellectual development. Your infant’s schedule will be flexible, following their cues for napping, diapering, feeding and playtime. Your child’s caregiver will communicate with you daily, providing a report of when and what was eaten, diaper changing information, nap schedules, and general observational notes about your child’s mood and activities during the day. In addition to providing a nurturing, stimulating environment, we constantly sanitize and disinfect the infant environment to ensure the health and safety of all of our children. Our caregivers are all trained in CPR and First Aid. We have health and safety procedures for food handling, diapering, feeding, cleaning linens and disinfecting toys. We will do our best to keep all of our children healthy and happy. curriculum is designed to build strong foundations for little ones ages 0-18 months.